Since our primary role here is as teachers for the missionary kids, I wanted to tell you a little more about our school. In some ways our school follows the traditional American curriculum and calendar. In many other ways our school is very different from the structure of an American classroom. 11:00-11:30 Math practice problems with 2nd and 4th, Math lesson with K.
4:30-5:00ish Visiting with the GSF toddlers and reading to them. I am extremely thankful that God has provided a young woman who grew up here at GSF to help me with teaching in the mornings and to be with our younger children at home when I go back to teach my afternoon classes. I can't imagine juggling all of this schedule without her help. Here is a photo of her helping our Kindergarten students. While it has been very busy keeping up with everything in my school day, it has also been a lot of fun. There are so many interesting opportunities we have living here in Uganda. Since each grade level has at most 3 students, we have a great deal of flexibility. Last week that flexibility was necessary. One of our students who had just recovered from Typhoid, was feeling really sick again. Her symptoms sounded like malaria, so I asked my 9 year old, Esther, to teach the 2nd graders while I took the sick student to the clinic to test for malaria. When her test was positive, we got the treatment for her, got her some food and drinks to take with the medicine, and took her up to my house to rest. As I returned to school the students were all working. Esther was feeling a bit behind, so I changed her schedule to have a study hall during the time she usually does sewing. She has been going to the tailoring shop in the afternoon 3-4pm and is learning to sew. She loves it and is currently working on making skirts for all the toddler girls. I will definitely need to take a photo when this project is finished. Last week we had a fun time learning about the letter "M" with our Kindergarten students. As we looked out the back door of our classroom we saw a mouse one day and monkeys in the matooke trees (a type of banana) another day. This week we are studying the letter "B" and found a bat outside our school, and not the baseball type. 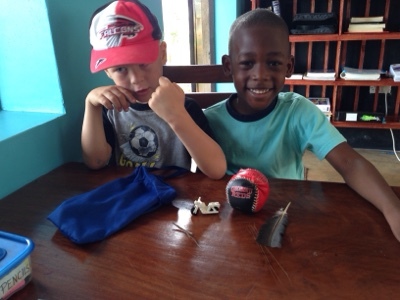 Here are some of the "b" items the boys brought, bag, baseball, bird feather, Boda-Boda, and bark. Then I gave them brownies and buttered bread. No, it wasn't a health class, but they enjoyed it! It has been fun to be able to reinforce the initial sound of words with such interesting things right outside our school, but it makes me a little nervous about what the rest of the year might hold. I am hoping we get to see a pangolin next week when we study the letter "P." If not the parrots will have to suffice. 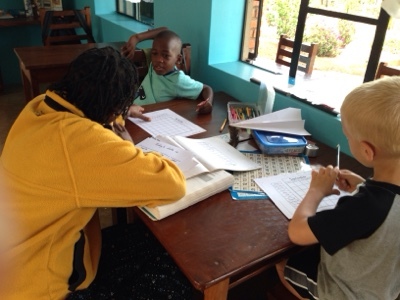 Since David and I do not have any experience teaching art, we have arranged for another missionary who is an art teacher to come from Jinja and do some art projects with our students. 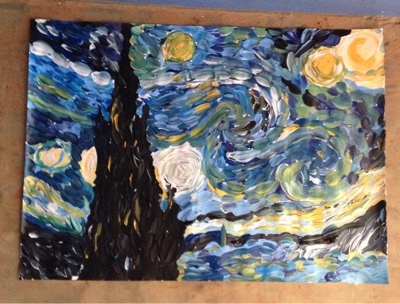 Yesterday they learned about post-Impressionism and VanGogh's "Starry Night" painting. They all had the opportunity to create their own version of Starty Night. 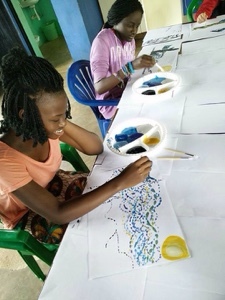 Our students thoroughly enjoyed their art class. We have some talented artists in our school! We are very thankful to have this amazing opportunity to invest in the lives of these missionary kids. We are excited to see what God has in store for each of them. Please pray for our students to really know God's love for them through Jesus and to be well equipped to take his love to the world.